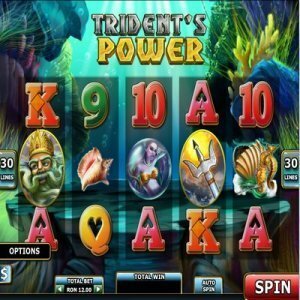 [miau] Trident’s Power is a brand new Underwater Mythology themed Slots game made from the people at The Gaming Lab. The object of this fun slots game is for the player to determine the treasures that are awaiting them on the bottom of the sea. The Trident’s Power slots game player can use up to 30 lines of play using the five reels and there is a unique choice if the Scatter symbol pops up. In this game, the player will actually get to choose the feature they want to play if the Scatter symbol appears, when normally a slots game chooses that for the player. Their choices of features include 25 free spins, All Wins multipliers or two or six times if they get a wild symbol, or a chance at 10 free spins and a higher type of all wins multiplier that multiples the winnings five time, or a wild multiplier that will x15 the winnings. There is even a gigantic wild multiplier option for 30 times the winnings. All of these super options make Trident’s Power an exciting game for players, as they have the chance to win a large amount of money on just a few spins with all of these crazy and lucrative options if they get the right symbols to show up in their spins. Players of Trident’s Power slots game can choose a maximum of six coins to play at once. The biggest regular jackpot is 2,000 coins, but there is a progressive jackpot that could possibly bring players a lot more money if they hit it! Plus, every so often the Neptune character comes up that shoots sea creatures and that brings more bonuses and the possibility of more cash. Another interesting feature is called the lost treasure. The lost treasure is bestowed on a player if they suddenly see three or more treasure chest symbols appear on their reels. Then, they must pick between six chests and have the possibility of getting a reward of a 500 times multiplier appearing that can give them a tremendous advantage of winning much more cash! There are also a series of colored jewels of red, yellow or blue. If a player gets five yellow ones, they get 1,000 coins, if they get five blue ones they get 2,000 coins and if they get five red jewels it triggers the exciting and lucrative progressive jackpot! That is the ultimate goal in Trident’s Power slots game. It can be very exciting to feel the tension when you know you might get all five red jewels and get to play the progressive jackpot since it can win a lot more than the 2,000 possible coins in the regular jackpot. All in all, if you love slots games and also like interactive animated video type games, then the slots game of Trident’s Power will be fun and maybe even lucrative for you!